Shares of Tesla (TSLA - Get Report) started off higher on the day after it was reported that it would receive "hundreds of millions" from Fiat Chrysler (FCAU - Get Report) . However, shares have closed lower, falling 64 basis points in Monday's session to $273.20. Fiat is reportedly paying Tesla for the latter's vehicles to count as part of Fiat's fleet in order for Fiat to avoid emission fines in the European Union. Some analysts have suggested that the payout could be as high as $750 million, a whopping figure for a company like Tesla. Remember, last week Tesla reported that first-quarter deliveries came in well below consensus expectations. It's not necessarily a demand issue plaguing the company right now, but more of a delivery issue as it began shipping the Model 3 to China and Europe late in the quarter. That said, these delays are costly to a company like Tesla, as the financial strains weigh on its cash flows and financial statements. Making matters worse, the company had to shell out $920 million to pay off a convertible debt loan in cash, since it could not use any stock to do so since shares entered March below the $359.88 conversion price. Then consider its efforts to build another Gigafactory in Shanghai, develop the Model Y for production next year and work on vehicles like the Roadster, Tesla semi and its pickup truck. It's very clear that Tesla could use all the capital it can, all the while trying to run its current business producing the Model S, X and 3. To say that these emission payments from Fiat are big could be an understatement for Tesla given its current financial position. 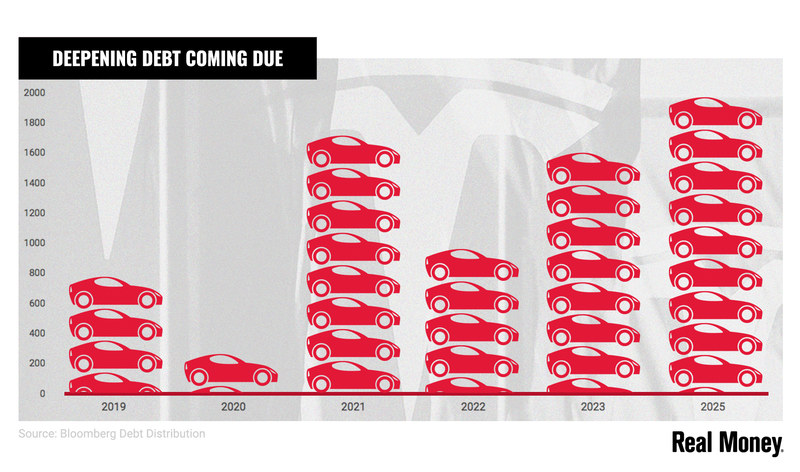 A look at Tesla's debt situation. A statement from Fiat read, "FCA is committed to reducing the emissions of all our products...The purchase pool provides flexibility to deliver products our customers are willing to buy while managing compliance with the lowest cost approach." Maybe this news will help stymie the cautious approach the analyst community is taking, but they may be unlikely to change their mind until they see the company's upcoming earnings results. After the first-quarter deliveries update last week, Goldman Sachs analysts reiterated its sell rating, while Baird analysts - who have a buy rating on the stock - said the company may now need to raise capital. JPMorgan analysts reiterated their underweight rating while cutting their price target to $200 from $215, while Canaccord maintained their buy rating but slashed their price target to $391 from $450. Morgan Stanley's Adam Jonas argued that Tesla would need to raise $2.5 billion in Q3, but cut his price target to $240 from $260 on Monday over worries about sentiment. Jefferies analysts also cut their target on Monday, dropping it from $450 to $400, while Needham cut their estimates and reiterated their sell rating. UBS analysts lowered their price to $200 from $220, while maintaining a sell rating on Tesla. That's a bevy of action and something that should certainly catch investors' attention. Even those that don't put a lot of stock in analyst opinions should at least note the more cautious tone Wall Street is taking toward the automaker. At this point, the $250 to $260 level becomes even more crucial in the name, as a break below could signal an even larger warning sign.